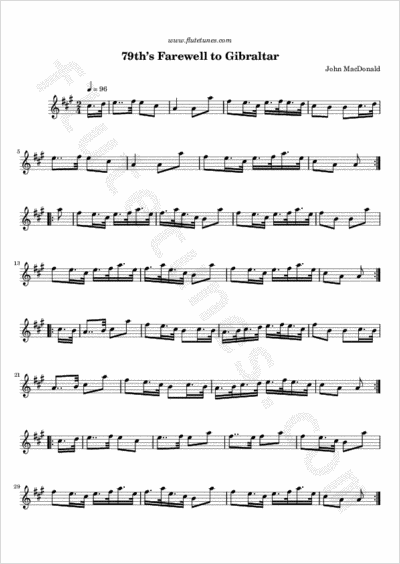 “The finest pipe march ever written”, as it has been called, was composed by Pipe Major John MacDonald in 1848, upon the occasion of the regiment's receiving orders to leave their post in Gibraltar. The 79th was originally supposed to have gone to the West Indies, a post notorious for its unhealthy climate and the inordinate amount of casualties due to fever, but at the last minute the regiment was posted to Canada due to the fortuitous intervention of the Secretary of State (who happened to be the commanding officer's brother). As reported by David Murray in Music of the Scottish Regiments, the title may have been somewhat “tongue in cheek, as the transport lay off Gibraltar for some days, delayed by contrary winds”. Formed in 1793, he 79th Regiment was known as the Queen's Own Cameron Highlanders until 1961, when it was merged with the Seaforth Highlanders to form the Queen's Own Highlanders.